Gold's Own Country malayalam movie, the directorial debut of Peeyush Ashar will feature Asif Ali in lead. Peeyush Ashar who had assisted Ranjith Balakrishnan, Santhosh Sivan and M.Padmakumar in many of their respective ventures turns independent director with Gold's Own Country. This movie is being produced by Siby Thottupuram and Joby Mundamattom under the banner of SJM Entertainment PVT Ltd. Toughed to be a complete entertainer, Gold's Own Country will be having other popular actors from the industry. Asif Ali, the most wanted young actor in malayalam might be busy arranging reception for the film fraternity after he got married to Zama Mazreen on 26th May 2013. Already having a number of movies in kitty, the actor has signed yet another project which is toughed as a complete entertainer. 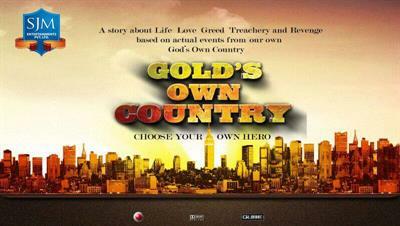 Tilted 'Gold's Own Country', this movie will be the directorial debut of Peeyush Ashar. Peeyush Ashar who had assisted Ranjith Balakrishnan, Santhosh Sivan and M.Padmakumar in many of their respective ventures turns independent director with Gold's Own Country. To be produced by Siby Thottupuram and Joby Mundamattom under the banner of SJM Entertainment PVT Ltd, this movie will be having other popular actors from the industry. Already being tagged as a busy bee, Asif is also a part of movies like D Company, Kothara and Red. His Honey Bee is currently under post production and is expected to reach theatres soon. Another interesting project on pipeline for Asif would be debut 'Driver on duty' directed by Manoj Palodan. Produced by Ravi Kottakarakara under the banner Ganesh Picture, this movie will mark the return of popular south indian actress Remya Krishna onto the silver screen. Asif Ali will don the character role of a driver in a women police station which would be totally different from his previous chocolate characters. In 'Red' directed by Vasudev Sanal, Asif will be seen along side with Sreenivasan, Lal, Manikuttan, Vijyakumar, Nandu, Nobi, Sudheer Karamana, Jaffer Idukki, Prasanth Alexander, Lena, Mythili, Vishnu Priya and Lakshmi Priya. Asif Ali who made his acting debut in 2009 with Ritu had made a successful career after being a part of 22 movies still now. With a number of movies in line, Asif wants to make his honeymoon much interesting with pans to go on a road trip to North India in his own vehicle.